We all know that when the CVM family comes together, we can accomplish anything. Now let’s show the world. March 27 is NC State’s inaugural Giving Day, a 24-hour push to celebrate the collective spirit of the Wolfpack and to strengthen its future. As a member of the CVM family, you can help us make a big difference. Here are some of the many, easy ways you can show your support for the CVM and NC State during the Day of Giving, including making direct gifts and taking part in fun social media challenges. Help us showcase the extraordinary Think and Do spirit that has propelled the CVM to its place as a top-ranked veterinary school and NC State as a top-performing university. 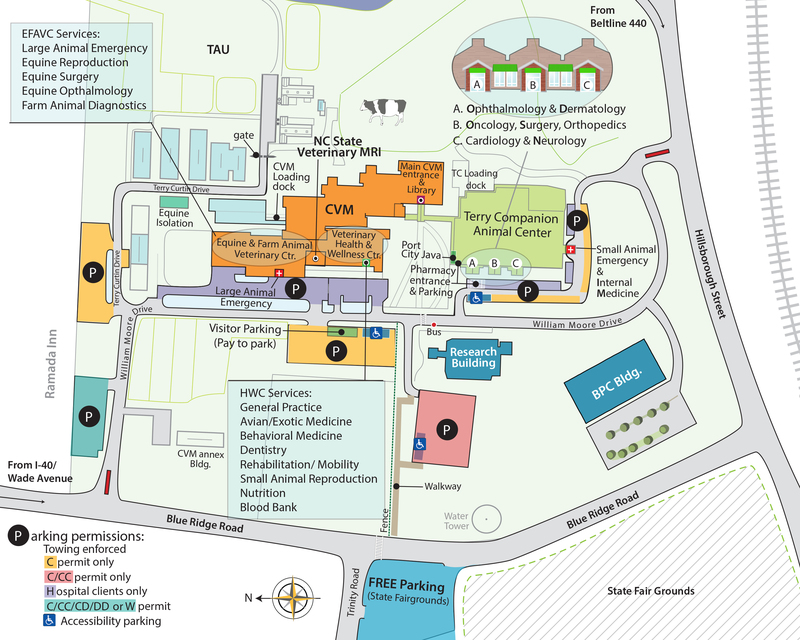 All Gifts Great and Small – Support the NC State Veterinary Hospital’s greatest needs. Companion Animal Pet Assistance Fund – Support the care of companion animals. Disaster Relief Fund – Support faculty, staff and students involved in disaster relief efforts. Giving Back Scholarship Fund for Veterinary Students – Support scholarships for veterinary students. Become a Day of Giving Social Ambassador: Use the link to our Ambassador Toolkit to download photos and gifs to encourage your social network to share, participate in social challenges and support the Wolfpack. One WolfPack Challenge: From 11 a.m. – 12 p.m. post the best photos of you showing off your Wolfpack pride on Twitter and Instagram. Use #GivingPack and tag @NCStateVetMed to help the CVM win an additional $3,000. Pack Pets Challenge: From 1-2 p.m. post photos of your pets wearing Wolfpack accessories on Twitter and Instagram. 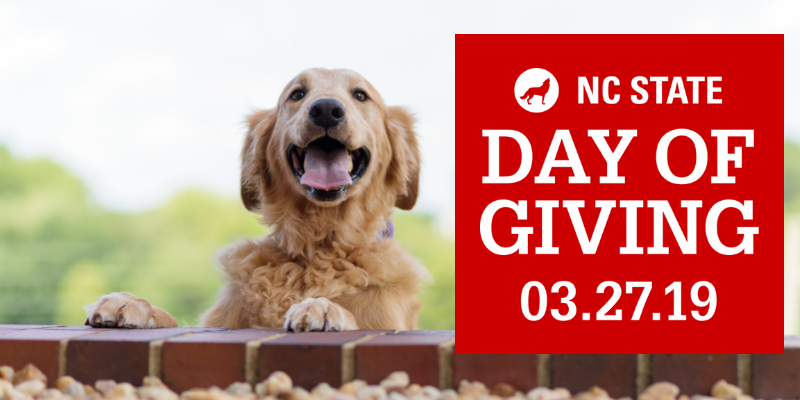 Use #GivingPack and tag @NCStateVetMed to help the CVM win an additional $3,000. Need some cute photos of you and your pet showing off your NC State gear? Visit our photo booth in the CVM Lobby between 11:30 a.m. and 1:30 p.m. Everyone is welcome to stop by and take their photo with their pet. Check out more hourly social challenges. 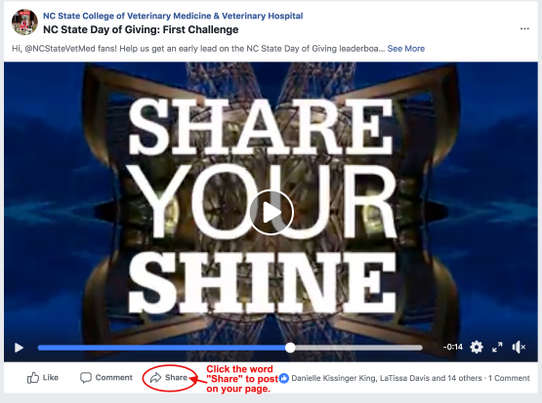 Share the Day of Giving Video on Facebook: As a Day of Giving warm-up, all NC State colleges are sharing the official NC State Day of Giving video on Facebook. The college with the most stares by March 27 wins $5,000 for scholarships. Help us win! Go to this link https://www.facebook.com/watch/?v=339584546660413 either on your cell phone or desktop and click the word “share” beneath the video to share to your Facebook page or any Facebook group pages. Click on this photo to share now!